A sprawling wasteland lies before you, wiped out by the centuries-old atomic blasts of The Great War. Beyond a smattering of hills, you can see the charred remains of a society you remember shiny and new. Through the bare foundations creep a collection of mutated critter's whose origins you can only guess, attaching whoever and whatever crosses their paths. Beneath the overgrown soil, vault-dwelling communities fight to survive on limited resources. It is across these abandoned spaces you must now travel, building a new life atop the crushed glory of a destroyed world. I hope we get this where I work. 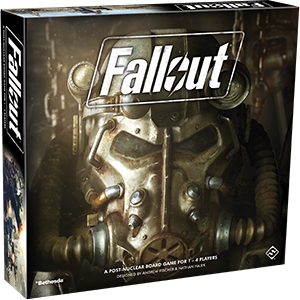 One niggling little thing, Bethesda did not invent Fall Out, only its current form. This looks more like the first two games, which were not made by Bethesda. 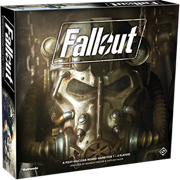 While Interplay started the franchise, Bethesda owns the rights to all things Fallout. They would have had to license this to Fantasy Flight, and the game ad copy was probably approved by them (and probably wouldn't have been approved by them if it had mentioned Interplay... the relationship between the two is... strained). I'm not saying you're wrong, I'm just noting the text is probably from the "back of the box," so to speak, and there's probably a reason it is the way it is that has nothing to do with accuracy and everything to do with IP ownership/branding concerns/etc. 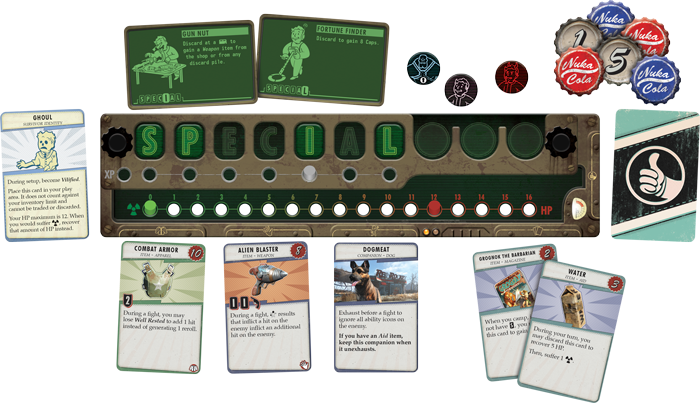 Although of course the aesthetic as remained similar throughout, the game artwork is distinctive to the perk artwork used in Fallout 4. The gameplay looks to be, relatively speaking, spiritually true to all of the games in the franchise--start out not knowing much of the world around you, slowly explore, fight stuff, get allies, loot things, etc. Anyway this looks really cool. Keeping an eye on release and reviews. Not the one I got her from the crazy little toaster at Big MT. It's not out yet and I'm not sure it follows the rules of any existing game per se. 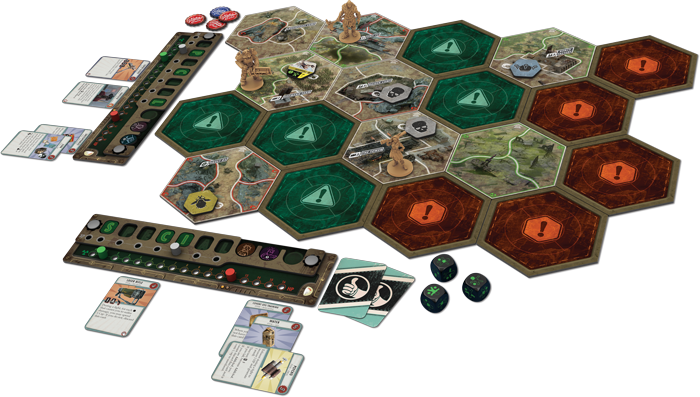 While it looks like some other hex-tile based games where you "build" the world flipping over tiles there's no way of knowing if it really plays like others until it comes out and/or more info is released. Fantasy Flight Games itself is a well known game publisher; they put out high quality games, although sometimes they are criticized for making things that are overcomplicated and/or take too long to set up. If you've played their games before you should at least know what to expect in very general terms of complexity and quality. Question -- any idea when the backorders will be fulfilled? I've heard some places won't get it again until April. I saw this in stock when it first came out in a local game store, and didn't buy it because I thought my sister had ordered it for me for Christmas. Turns out she waited and then it was out of stock at her local store. (I got two sets of bedsheets instead. Useful, but nowhere near as exciting.) And then of course by the time I checked here--and everywhere else---it became out of stock. Amazon appears to have it in stock, but for some reason they are selling it for $75.99, $20 more than retail. I'd rather pay Paizo for the shipping instead. Sooo so very sad I didn't buy it when I saw it. Since I'll have to put in an order for it somewhere it may as well be here, but I'm curious to know how long I'd have to wait. When I ordered this last week it could be shipped immediately, but I elected to have it ship with my regular shipment. Now that my regular shipment is processed, this item is now on back order. Shouldn't sidecart items be taken out of inventory so that those of us who ordered it first and waited to ship aren't left high and dry because someone else who orders it later gets theirs just because they say ship now?